The first stage of the Tour de France was won by Fernando Gaviria and was marred with crashes and other incidents. Here's a roundup of news and reactions to this first day of racing. EF Education First Lawson Craddock has crashed at the feeding zone and was seen covered in blood and in a lot of pain during the stage. After the stage, the American underwent a medical check-up that revealed a small fracture along the spine of his left scapula and a laceration in his eyebrow that required sutures. "Right now it’s extremely painful," said the rider. "It was really painful out on the road just trying to manage it as best I could. I got incredible support from the team to help me to the finish. "It’s difficult. A lot of work goes into these races, especially the Tour. Mentally it’s almost harder than physically. I’ll try to stay positive, manage the pain as hard as I can. I’m not just going home at the first sign of adversity, so I’ll see how I feel tonight, how I sleep, how I feel in the morning and get on the bike and see if I can manage it." BMC Racing Team's Richie Porte has lost time at staying behind after the crash that broke the peloton in two. The rider managed to arrive at the finish line at 51 seconds from stage winner Fernando Gaviria. "It was pretty nervous there. 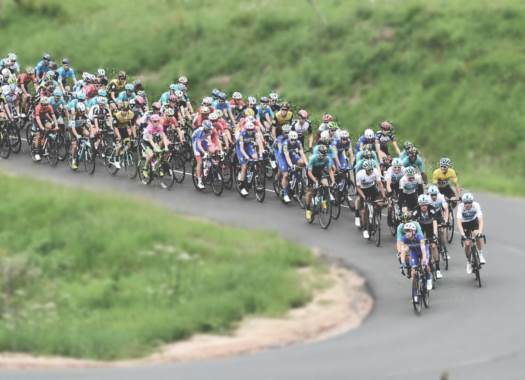 It was not ideal but I think (Nairo) Quintana has probably lost more [than me], (Chris) Froome was there, and (Adam) Yates was there," said the rider after the finish line. "That's the Tour. I was pretty close to coming down. I sort of rode Damiano Caruso, my teammate, into the ground and that softened the blow. I don't really know what happened, to be honest, it's just one of those things. It's all ok and the next thing, there's a crash in front. There were a few more crashes after that." Bora-hansgrohe's Peter Sagan has finished second in the opening stage of the Tour de France. Even though he couldn't get the Yellow Jersey, he looks at future stages with hope. "The Tour de France got underway today with a fast stage!" he commented. "It was flat, with a parcours that suited the pure sprinters and, as expected, we had a brisk finishing sprint. The guys did an excellent job throughout the stage and in the tense final kilometres protected Rafa? and me from all the trouble. We stayed clear of all the crashes. I felt my legs in good shape and took second in the stage. It's just the start of a long Tour de France."